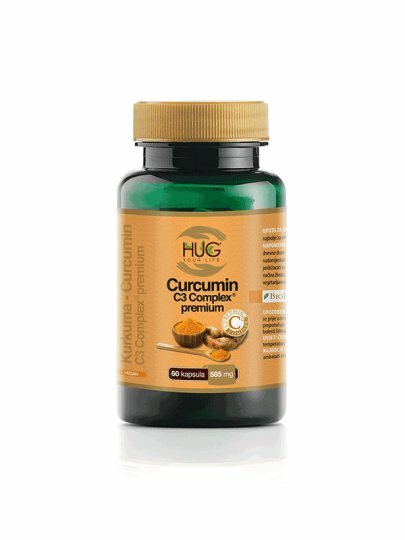 Curcumin C³ Complex® is obtained from dried Curcuma Longa (Turmeric) rhizomes and is standardized to a minimum of 95% of curcuminol. The name C³ Complex® is linked to the 3 major chemical compounds: curcumin, demethoxychloroquine (DMC) and bisdemetoxycurcum (BDMC) - commonly known as curcuminosides. Curcuma longa curd extract (contains at least 95% curcuminohydrate), maltodextrin, dry peppercorn black pepper extract (contains at least 95% piperine), antifoaming agent: magnesium salts of fatty acids, hydroxypropyl methylcellulose (capsule). Capsules are herbal origin, suitable for vegetarians. Drink 1-2 times daily 1 capsule, preferably during meals.